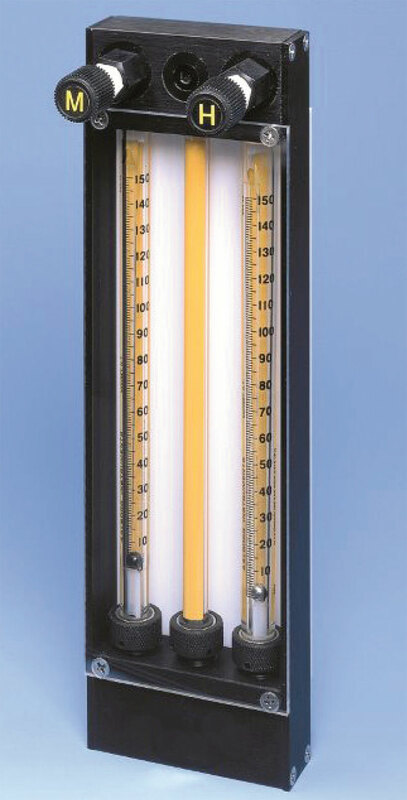 The gas proportioner meters the flow of each of two gases and mixes them thoroughly in a special mixing tube to produce homogeneous two-component mixtures. Concentration accuracies of 10% of component value are maintained with a standard unit using typical calibration curves. (In a desired mixture of 1% of gas A and 99% of gas B, a concentration between .9% and 1.1% is maintained.) Individual units can be calibrated for non-corrosive gases to attain an accuracy of 5% of the component value. Individual calibration curves are supplied with these specially calibrated units. The control valves are installed at the outlets making these gas proportioners back pressure compensated. The readings on the tubes are accurate regardless of the downstream pressure, so long as the inlet pressures are maintained at the levels for which the tubes were calibrated. These proportioners are available in both aluminum and stainless steel construction. When ordering a gas proportioner, specify the composition of the desired mixture, the gases, the discharge rate, and inlet pressure in addition to the model number. * For best performance, it is recommended that tubes have only one float. * If unsure of correct tubes, provide the composition range of intended mixtures, total outlet flow and operating inlet pressure. We will select the tubes.